We are having a real Minnesota winter this year! 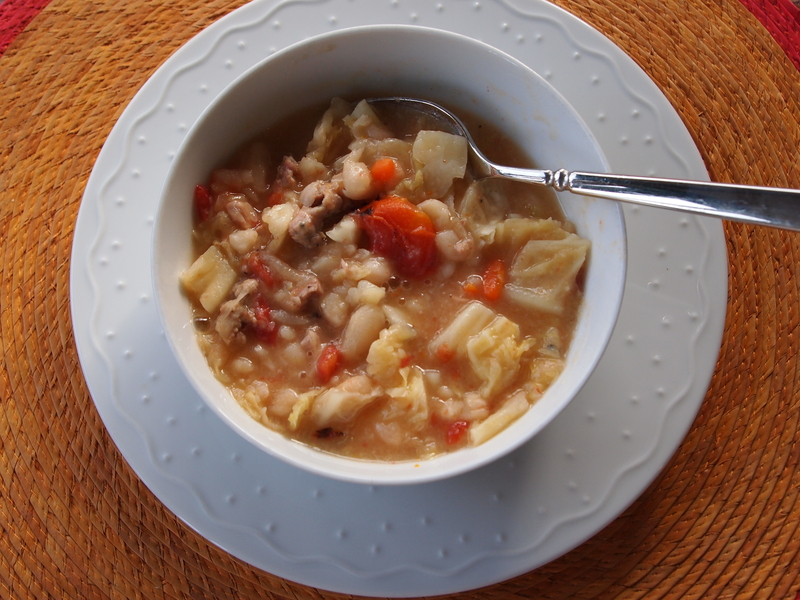 A recent Sunday plunged to minus 14 degrees F, necessitating a hearty and warming stew. I spied this recipe on The Bitten Word blog, saw that it was their take on a Cook’s Illustrated recipe and was sold! It’s one of those recipes from Cook’s where they have experimented with many different methods to come up with the perfect approach. For this one, the recommendation was to brine the beans overnight and to cook slowly in the oven to achieve a creamy stew in which the beans remain mostly whole. 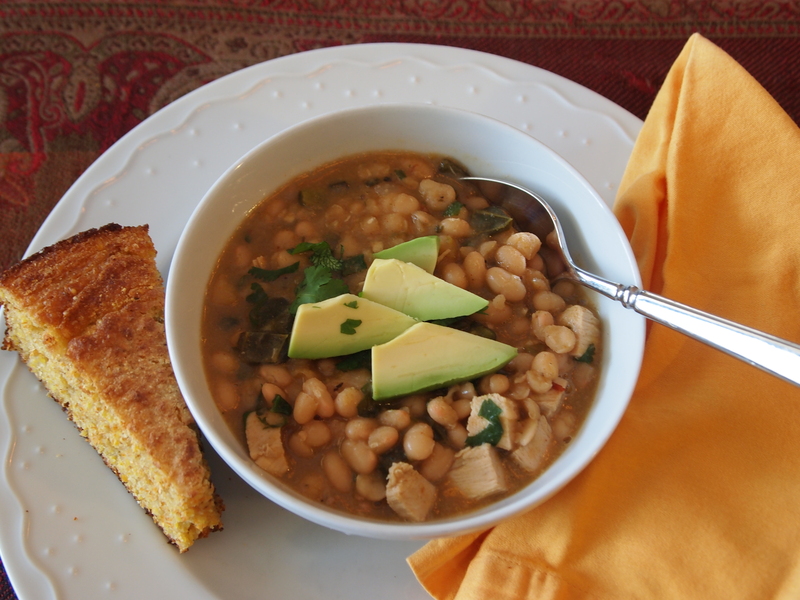 We love Cook’s scientific approach to things here at S&SK and so jumped on this recipe. It turned out as promised! Margaux and I both cooked this, as well as my brother John, so we have lots of experience and opinions to share on this stew. We may have diverged a little on ingredients or methods, but one thing we all three have in common is that we thought this was delicious! 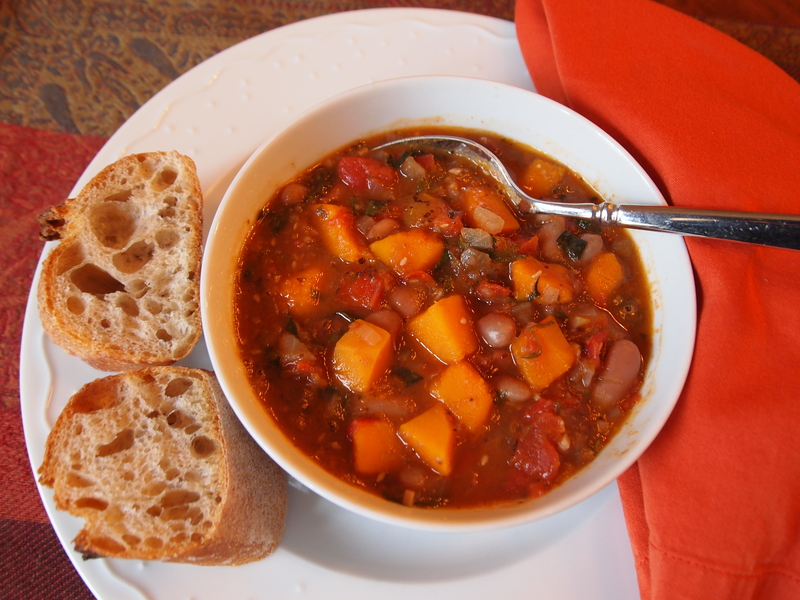 The whole family loved this stew…even my 4-year-old, who has recently decided he is a picky eater. But picky in a way most kids are not…he’ll refuse to eat his mac & cheese, and instead gobble down a salad. And lately, anything I make that has everything “mixed together,” ie., stews, soups, casseroles, etc…basically everything I make in the winter…is deemed inedible. Or as he says, “gross.” But I thought I might have a “win” on my hands here, with beans, sausage and carrots included in the ingredients (some things on the “ok” list), and I was right. Dissolve the salt in the water in a large bowl or pot. Add the beans and soak overnight or up to 24 hours. Drain the beans and rinse thoroughly. Set aside for use in the stew. Pre-heat the oven to 250°F. In a large Dutch oven, preferably cast iron, heat 1 tablespoon of the olive oil over medium-high heat. Brown the sausage, breaking up into small pieces with a spatula or wooden spoon. When browned, remove from the pot and place on paper towel. Set aside. Add the remaining olive oil to the pot and turn heat down to medium. Add the onions, celery and carrot and cook, stirring occasionally until softened and lightly browned, 8-10 minutes. Add the garlic and cook till fragrant, about 1 minute. Add the stock, water, bay leaves and soaked beans. Increase heat to high and bring to a bubble. Cover the pot and place on a rack in the lower middle of the pre-heated oven. Cook for about 45 minutes or so, until beans are just softened but slightly firm in the center. 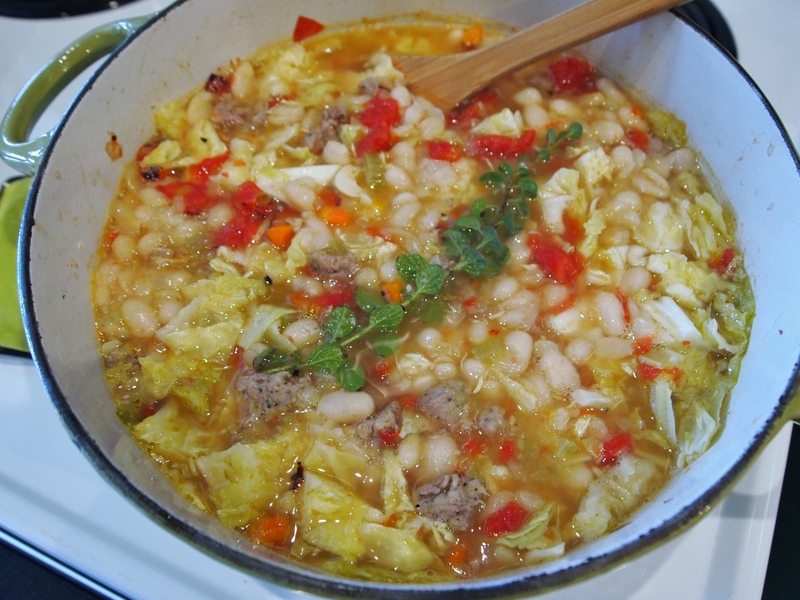 Remove the pot from the oven and stir in the reserved sausage, cabbage and tomatoes. Place back in the oven and cook for another 30-45 minutes or so, until the cabbage is tender. Remove pot from the oven and submerge the oregano sprig in the stew. Cover and let stand 20-30 minutes. Remove the oregano and bay leaves. Add salt and pepper to taste. Serve with a little drizzle of olive oil if desired and a nice crusty bread. COOK’S NOTES – Aunt Suzy:Ingredients The original recipe called for 1 1/2 pounds of sausage. I used 1 pound (of turkey sausage) and thought it was still too much, although I prefer meat in recipes like this for flavoring vs. a main ingredient. I used 3 cups of water, but my stew came out very thick so I think I’ll try 4 cups next time I make it. Adjust meat amount and liquid to your preferences. I used a garlic press for my garlic, which I think resulted in a less garlicky result than Margaux described; she crushed the garlic with a knife blade (although I love garlic, so I might try that one day!). Regular green cabbage can be substituted if you can’t find Savoy. The original CI recipe called for pancetta and kale – I think we need to try that one also! Methods I learned 3 things from this recipe: 1) The brining made for ultra-creamy beans as promised, 2) Cooking in the oven at a low temp made for beans that did not break apart, and 3) Adding tomatoes later in the cooking process insured that the skins of the beans were not tough. COOK’S NOTES – Margaux: I made this on a weeknight, but I prepped everything ahead of time on Sunday, so it made it very quick and easy. Otherwise, this is one that I would probably make on a weekend, because it does take awhile, and you have to remember to do the beans the night before, etc. So I soaked the beans, chopped the cabbage, carrots, onion and celery, and had them all stored in the fridge and ready for Tuesday night. Also, I only used 3 cups of water instead of 4, as we like our stews less brothy around here.